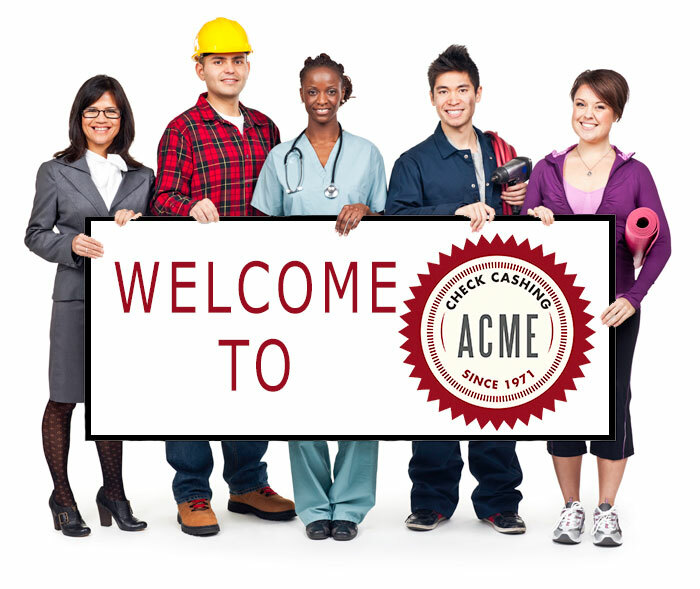 ACME Check Cashing is a family owned business since 1971, licensed by the NJ Department of Banking & Insurance. ACME Check Cashing Services (also known as ACE) located in Elizabeth NJ, Rahway, NJ and Edison, NJ offers a full range of check cashing and money order services so you can get your money right away without having to wait for a check to clear. We offer friendly, courteous and professional service, providing all financial services for cashing checks including corporate, payroll and government along with moneygrams and pre-paid debit cards. You can also pay all your bills with us confidently knowing that they will be paid on time. Si, hablamos Español. Tired of high bank fees? Come to Acme! Have a few extra dollars to spare? We also sell Lottery Tickets! Offering check cashing services in NJ near Union County, Middlesex County and all of the surrounding areas including New York, Pennsylvania and Connecticut.